"[Mel] managed to escape through the gate and I ran after him. By the time I saw him hit he was in the middle of the street. I took him in my arms and brought him home," Jean told Guarda-Sol.The photographs, which were captured by photographer Rafaela Martins, appear to show Jean braving busy traffic before grabbing Mel, who the story says is well and is at home recuperating and receiving medical attention. "[Mel] managed to escape through the gate and I ran after him. By the time I saw him hit he was in the middle of the street. I took him in my arms and brought him home," Jean told Guarda-Sol. 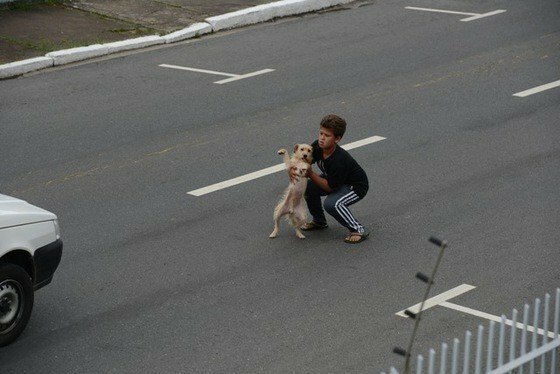 The photographs, which were captured by photographer Rafaela Martins, appear to show Jean braving busy traffic before grabbing Mel, who the story says is well and is at home recuperating and receiving medical attention.